Want a low-cost and high-performance P&ID program used on Mac similar to Visio? 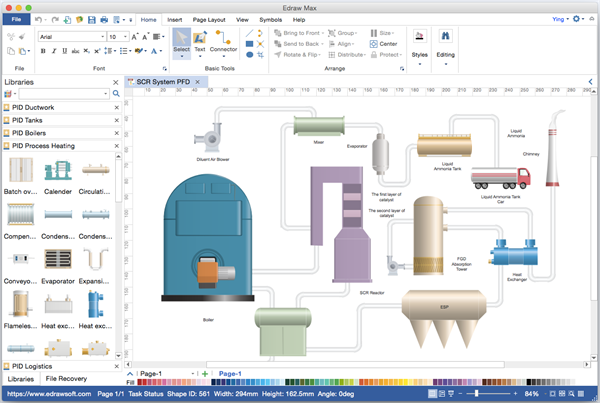 Edraw is a powerful and popular Visio substitute for making P&ID and other drawings easily on Mac system. With some more powerful Visio alternatives out there for both Windows and Mac systems, why still empty your pocket for the expensive Visio? To benefit Mac users, Edraw has newly released a Mac version allowing users to create piping and instrumentation diagram easily on Mac OS X system. Experience more at lower cost. All users can upgrade the program for more functions for free. If you want to save time and money, Edraw is just the right choice for you. Edraw is a vector based diagramming software containing similar features with Visio. It helps users at any level to create, modify and manage P&IDs faster and more accurately. Designed with an interface similar with Word, Edraw is familiar and easy to use. The P&ID symbols are comprehensive, accurate, and with a customizable capability available to be edited. With this Visio like tool, users can develop professional P&ID in a way easier than ever. Be able to insert a table same as Microsoft Word. Available to collaborate with team members through Cloud sync. Drag-and-drop based interface to draw any kind of P&ID. A series of symbol libraries dedicated to creating P&IDs. Both black and white symbols and photorealistic colorful shapes are available. Each symbol is assigned with connection points. Some have attached floating action buttons for easier editing. A variety of ready-made templates and examples which are fully customizable. An advanced package of diagramming solutions including not only P&ID design tools but also about 200 kinds of chart creators. Offers a clear and concise visual illustration of all facilities, including pipes, valves, sensors, instruments and so on so that all involved parties can have a solid understanding of the process. Inform readers about information that can facilitate analysis of risks, safeguards and potential faults. In this way, all kinds of errors can be identified as early as possible and be minimized and ideally eliminated. Be conducive to development of operating and maintenance procedures. Serve as an as-built record of the process so that changes can be planned safely and effectively using Management of Changes (MOC). Besides P&ID, the program is also capable in making other diagrams such as org chart, flowchart, network diagram, mind map, infographics, workflow, gantt chart, etc.